Enter the competition HERE for a chance to win 1 of 10 copies of The Right Bite by Jackie Lynch – your survival guide to eating healthily on the go. The giveaway ends on Thursday, May 26. Bran muffin or chocolate chip? Which wine is likely to add the most inches to your waistline red, white or sparkling? And if you re dying for a pizza, how can you keep the damage to a minimum? The Right Bite is a practical guide to help people navigate the minefields of everyday eating and make healthy choices when nutritious food is not easily available – such as in coffee shops, office lunches or the cinema. It’s easy to follow a healthy diet when you’re in control of your shopping list and the contents of your fridge. But as soon as you step outside the front door, it can get a lot more complicated. Walk into a coffee shop, a bar or the cinema, and making the right decision can be a lot more challenging and confusing. 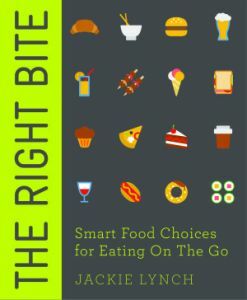 The Right Bite is here to help – with accessible, practical advice for all those everyday occasions, you can make the smart choice even when healthy options are limited. Each chapter focuses on a different eating environment – from Breakfast on the Go to Working Lunches, Takeaway Food, Pubs, Picnics, Barbeques and the Cinema. For each situation The Right Bite then explores the type of foods likely to be available and compares them, explaining the main health pitfalls and highlighting top picks. A ham and cheese croissant is a better option in a coffee shop than a skinny muffin for example! The Right Bite explains why, providing useful insights with a down-to-earth approach. Packed with design features and small enough to slip in your handbag, this is the one-stop guide for anyone wanting to eat healthily in the real world. 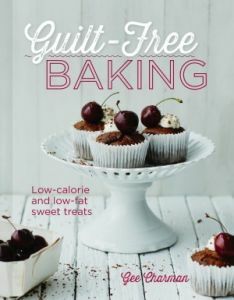 Win a copy of Guilt-Free Baking by Gee Charman! We are giving away a copy of Guilt-Free Baking by Gee Charman! Enter our competition below. The competition ends on August 19 and the winner will be randomly selected! https://nourishbooks.com/wp-content/uploads/2015/08/guilt-free-backing.jpg 300 340 Nourish https://nourishbooks.com/wp-content/uploads/2018/04/NourishLogo340x156-300x138-300x138.png Nourish2015-08-11 16:47:372015-08-11 16:47:37Win a copy of Guilt-Free Baking by Gee Charman!